How can consumer behaviour be changed to reduce trade in illegal and unsustainable wildlife products? Utilising theory and methods from public health, computer science, economics, psychology, ecology and sociology to address this pressing 21st century issue, we aim to advance these disciplines as well as create a new interdisciplinary research foundation within conservation science. This will develop new frameworks, approaches and methods for understanding consumer preferences and motivations. 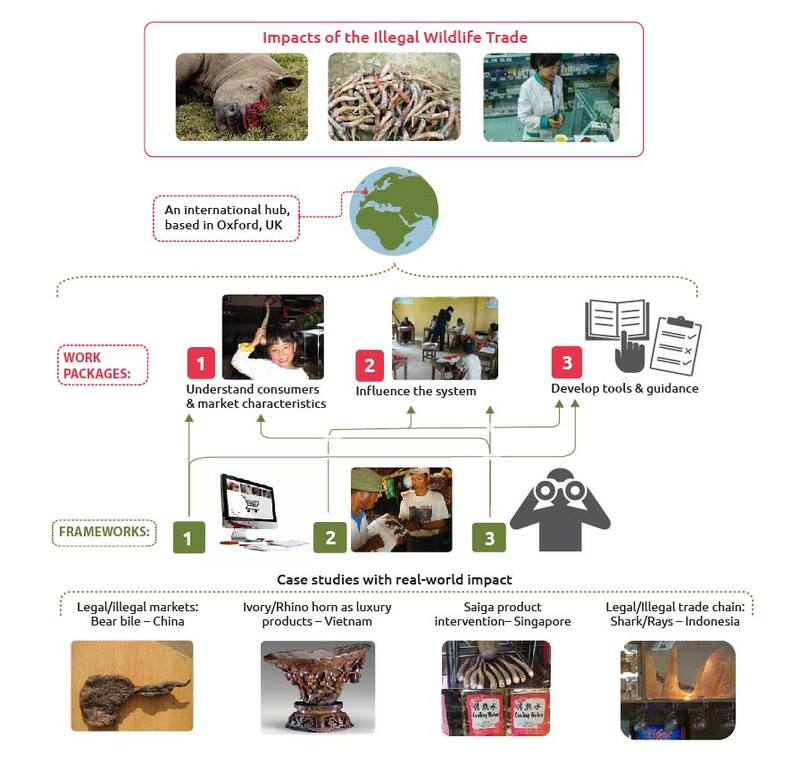 By exploring the dynamics of physical and online markets for selected illegal wildlife products, we will have a better grasp of how scientific progress changes the landscape within which these markets operate. Understanding consumer and market characteristics will provide insight into consumer motivations and behaviours, market magnitudes and dynamics, and interactions between product types (legal and illegal, substitutes and complements). Testing innovative interventions to change consumer behaviour for selected illegal wildlife products, we will evaluate the true impact on consumption of these products, thereby influencing the system. Specific interventions will be developed, implemented and evaluated to ascertain a quantifiable change in behavior. Our research will be further translated into impact by exchanging knowledge through various means, forums and by providing tools and guidance for others to intervene effectively to tackle the illegal wildlife trade. All of these components and objectives will be informed and guided by our programme’s case studies and collaborative projects across different taxa and regions.